If the moment doesn’t pass, that’s it—you’re done. And if the moment does pass, it never goes that far. It stands in the distance, ready for whenever you want it back. Sometimes it’s even there when you thought you were searching for something else, like an escape route, or your lover’s face.How does one talk about love? Do we even have the right words to describe something that can be both utterly mundane and completely transcendent, pulling us out of our everyday lives and making us feel a part of something greater than ourselves? Taking a unique approach to this problem, the nameless narrator of David Levithan’s The Lover’s Dictionary has constructed the story of his relationship as a dictionary. Through these short entries, he provides an intimate window into the great events and quotidian trifles of being within a couple, giving us an indelible and deeply moving portrait of love in our time. David Levithan is the author of many acclaimed young-adult novels, including the New York Times bestselling Nick & Norah’s Infinite Playlist (with Rachel Cohn), which was adapted into a popular movie. He is also an editorial director at Scholastic. This book is why David Levithan is an acclaimed author. He can take a small idea and very few words to make an impact that would take most authors a lot of words. 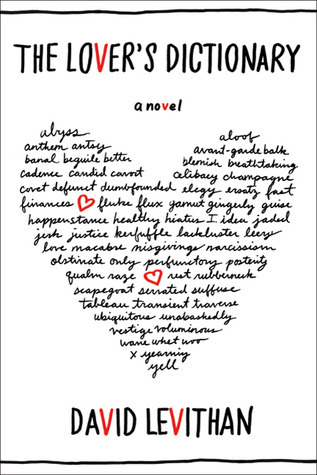 This small book based on definitions and span the alphabet is a new take on a romance that falls apart. The tale goes back and forth in time and takes small things that lead up to how a relationship actually builds and then breaks. Although it is mostly a sad look at a romance, there is a lot of humor and heart woven in through the short chapters. Fans of Six Word Memoirs and Post Secret will adore this one. I’m reading the tweets , and loving it!